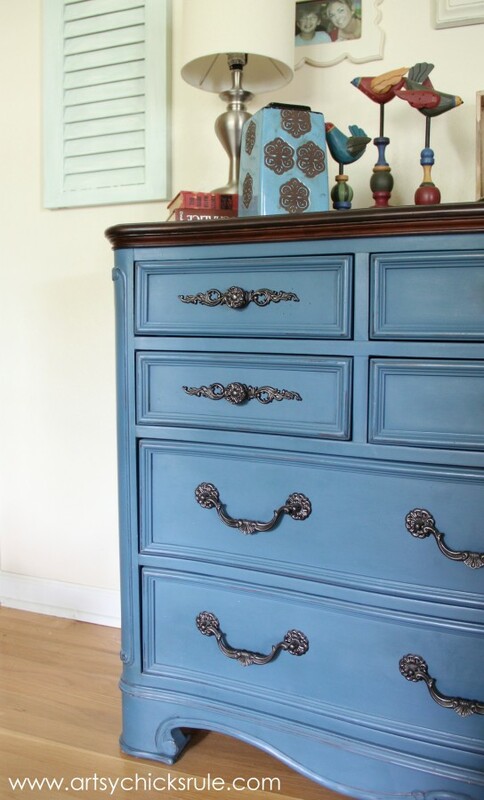 Today I’m sharing this $35 thrift store dresser that I painted in the gorgeous, Aubusson Blue Chalk Paint. And it is painted in the most fabulous shade of blue! Aubusson Blue. It went from a dirty, scratched & beat up thrift store find, to it’s new found greatness right here in my own home. A treasure in the rough for sure! Now a very much loved piece of furniture. And one that gets the most “oohs and ahhs” every time someone sees it. Look at the details and the curves. Goodness just waiting to be revealed. The top was in really bad shape. It was scratched, gouged and stained with something black, all over. But I had a vision for it. I wanted to keep the top natural. In a nice deep, rich shade like walnut and paint the rest. And knew exactly where I was going to put it. You can read the post about the “Missing Hardware” dilemma here. Want to find out which one and how I did it?? You can, >>> here. And here it is in the middle of the painting process. 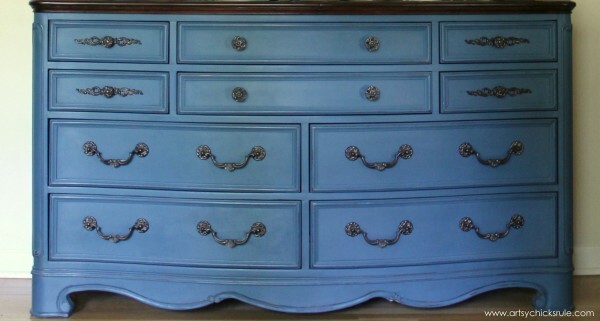 ASCP (Annie Sloan Chalk Paint) in Aubusson Blue. 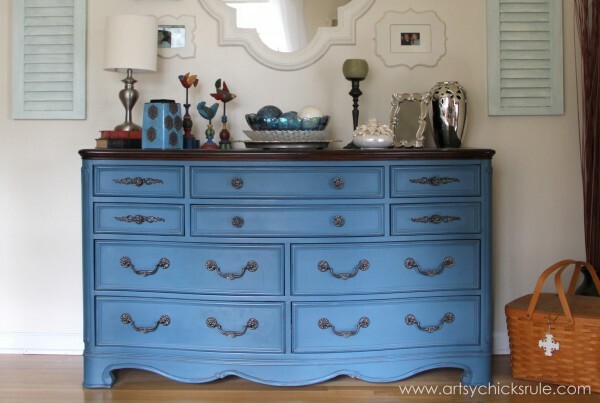 Provence is my second favorite and that has nothing to do with this dresser. But it is. 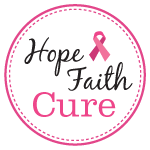 I’ll include affiliate links for this project below. 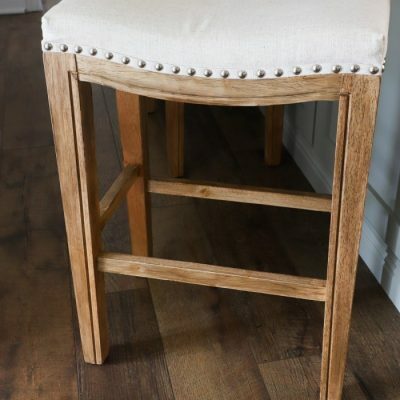 I know Annie Sloan recommends doing it after waxing but I personally like doing it before. Next, I mixed a bit of her dark wax in with some clear wax. Just a very tiny bit. I waxed the entire piece and hand buffed to create that gorgeous sheen. Isn’t that color just fabulous???? Love in a can. I don’t have any pictures of the stripping and sanding part. Sorry, bad blogger I know. But I used my absolutely favorite stripper and my handy dandy little best friend—>my sander. I sanded the top down to reveal a nice, smooth, beautiful wood under all the junk. I then used this stain for the top. After that, I put several coats of Satin poly on top. I don’t like things too shiny. 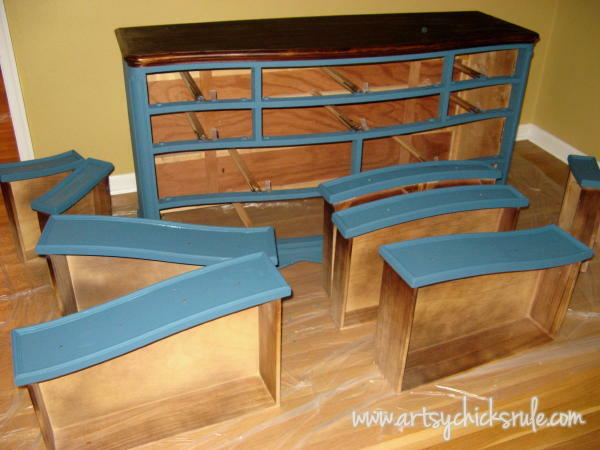 Look at that gorgeous wood…….and that pretty Aubusson blue paint. Oh my. 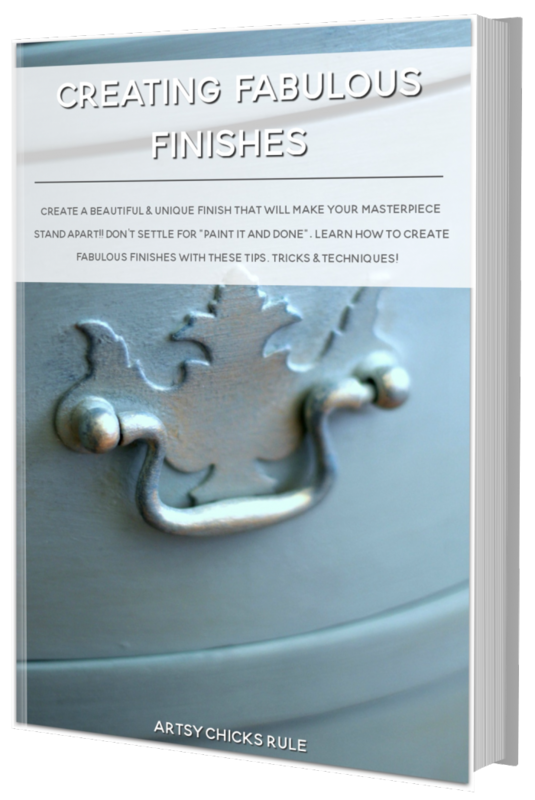 Want to read about 26 other chalk paint style paints available?? I love color…and I LOVE paint. But I do love wood peaking through here and there. I try to keep a bit in some of my re-do’s. That’s right, I just might! He’s a funny one. The hardware all got a quick spray with Oil Rubbed Bronze and a touch of gold. So…… is it dilemna or dilemma? And do you love this shade of blue as much as I do? UPDATE 10/18!! 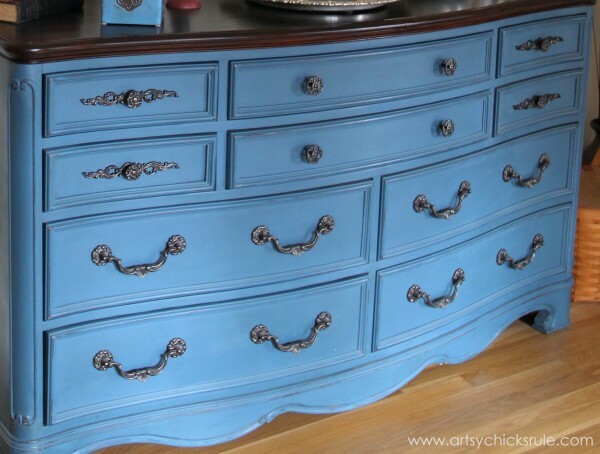 Did you love this Aubusson Blue Dresser? Well, I’ve since given it ANOTHER makeover! 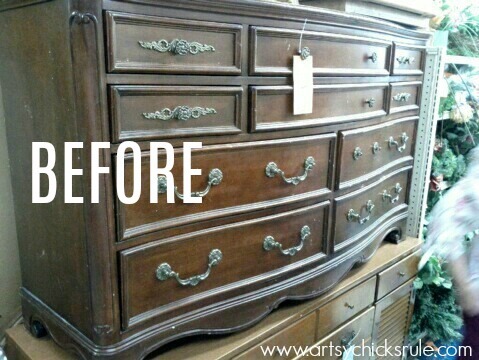 See it here >>> Chalk Paint Dresser Makeover…Again! Since I haven’t done this process (yet), is it the paint or do you sand to have the wood peaking through? BTW, I am now following your posts via email since I hope to learn more from you. This particular paint does make it easier to “distress” but yes, you do have to sand lightly on the edges to have the wood peek through. 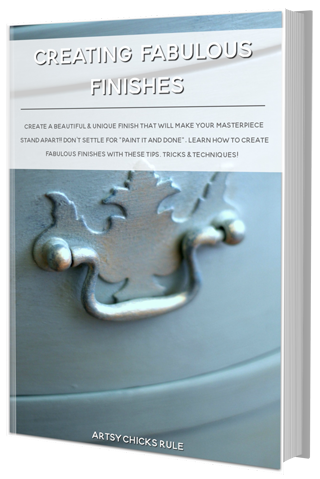 With the chalk paint you can even use a damp rag to lightly remove some of the paint in areas. So glad you are following me! 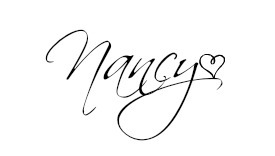 :) I love to DIY and I have so much more to share yet! Thank you Kristi :) This is one of my favorite pieces of furniture that I’ve redone! 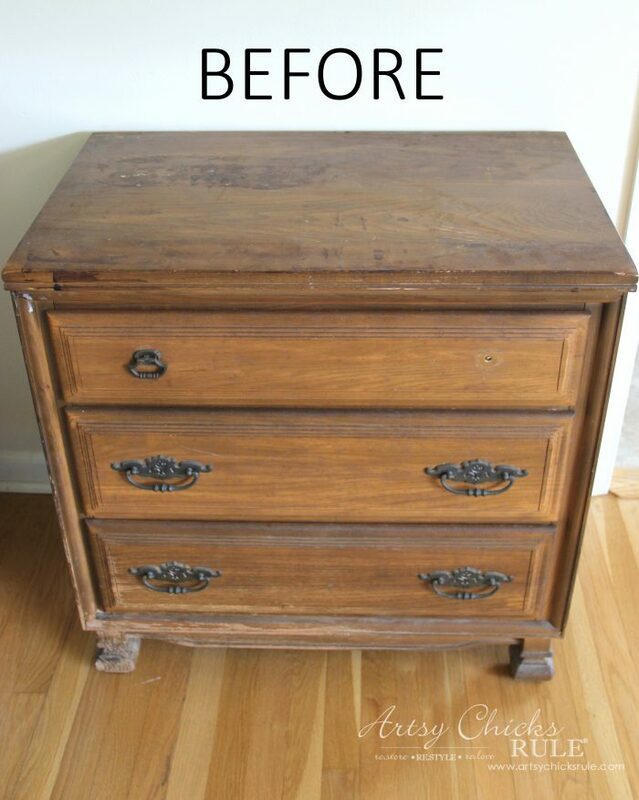 I love your dresser transformation! Thank you so much for sharing it at my Twirl & Take a Bow party! Stop by tomorrow to see it featured! Feel free to grab a “featured” button too! Have a great week. I’m so excited you are featuring it! Thank you!!! Love your work! Are you using it as a dresser or as your entry table. Thank you. :) I am using it in my study. It is getting ready to get a decorating makeover though! Not the dresser but the items on top and the wall behind it. :) I will take pictures once that is complete! Thank you so much! 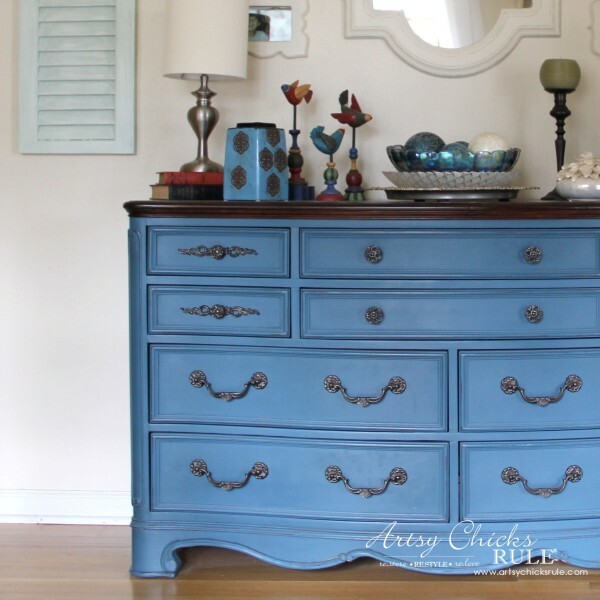 I just love Aubusson Blue…it’s just so fabulous! I bet yours are beautiful too! Oh yes, Peggy! You must try it. You won’t regret it!! I absolutely love your dresser!! It’s my inspiration for a dresser I am going to be painting for my boys’ room!!! Thank you so much. :) Would love to see yours when it’s finished! 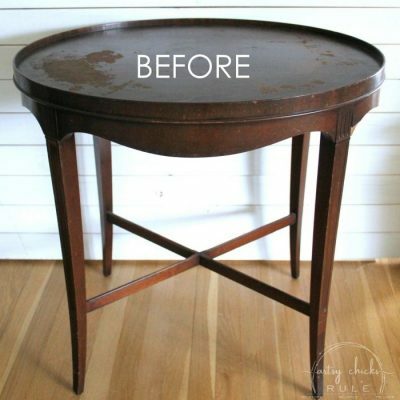 LOVE this gorgeous transformation! The Aubusson Blue is perfect on that piece! 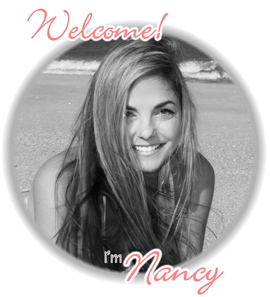 Thank you so much for sharing at Get Your DIY On, friend! 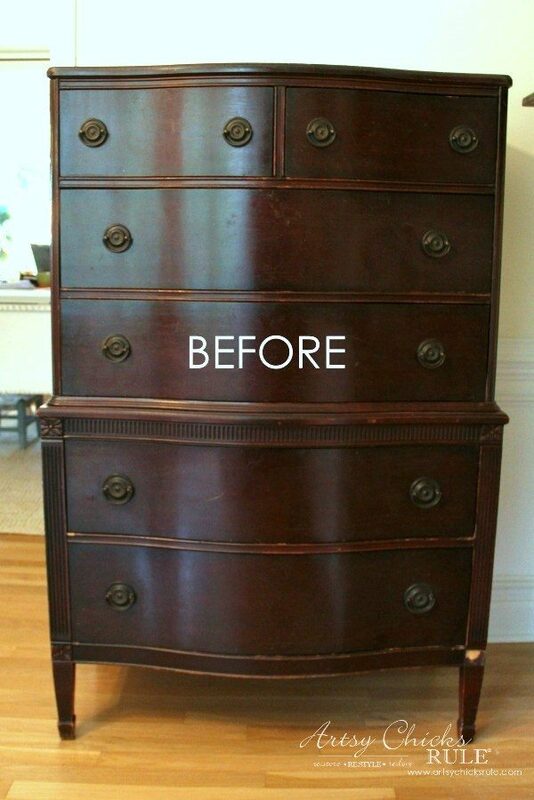 Hi there – I see this chest of drawers was done a while back from the comments, well a few years! However I just wanted to query that the colour you used was actually Aubusson blue as it looks more like ASCP Greek Blue or even Giverny! Aubusson is so much darker. 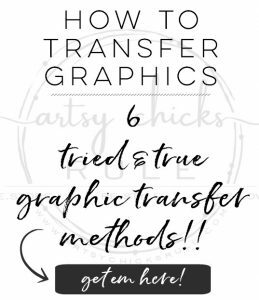 The transformation is brilliant and I love the colour chosen – have been following you for a few months only …. it was this colour that caught my eye for a project and I use mainly ASCP on all my upcycling projects and so checked tjecolour chart – did you mix it with Provence perhaps??! Anyway I think your work is fab! 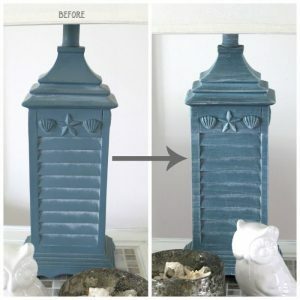 I’m new to your blog, found you thru Get your DIY on (I think). Love to see how great bloggers do their pieces. I’m yet to do anything important, just some of my own older pieces I’ve had for ages. Thought that would be a good start, no problem if they don’t come out the way I’ve hoped they will. Good practice. 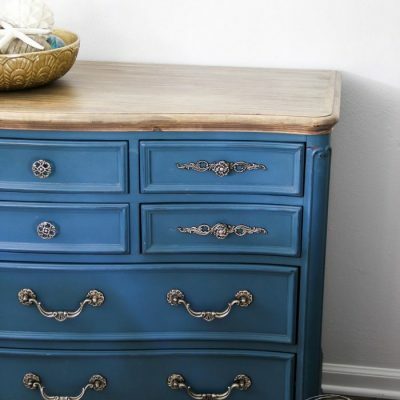 Love how you did the dresser, so nice, the top is gorgeous with the pretty blue. 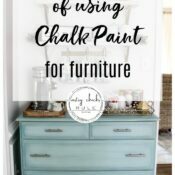 I’m not able to buy Annie Sloan so if I use chalk paint it has be made by me. 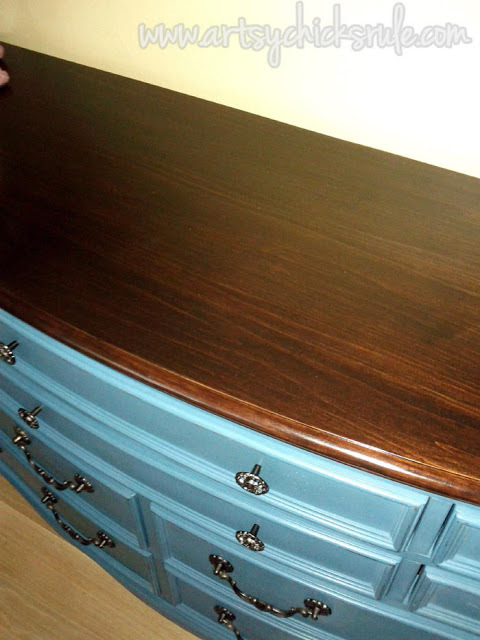 The hardware on your dresser is so nice, looks like you cleaned it up but looks great with blue paint/walnut top. Love the wood top much better than if it was painted. 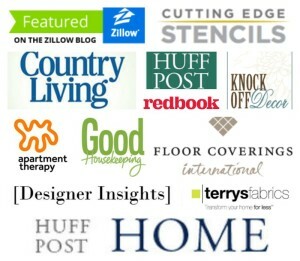 I’ve noticed many bloggers redo wood tops, so glad. Thanks so much! I love to leave some wood on some of the pieces I do. I love the mix of the color & wood combo. Thanks so much for stopping by! 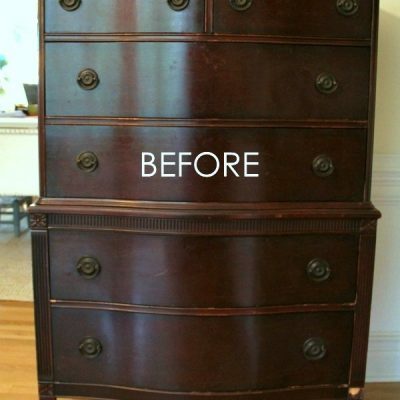 Real quick question… Do you paint the inside of the drawers? I’m getting ready to do my first dresser and I’m excited but I’m not sure about the inside of the piece. It depends on the piece. Sometimes I do and sometimes I don’t. Sometimes I’ll even line them with paper. Just depends really. If it is in bad shape then I definitely do one of the 2!! Nope, I didn’t strip anything except the top that I sanded and re-stained/poly’d. The rest of the dresser got washed and painted. No other prep but the washing. 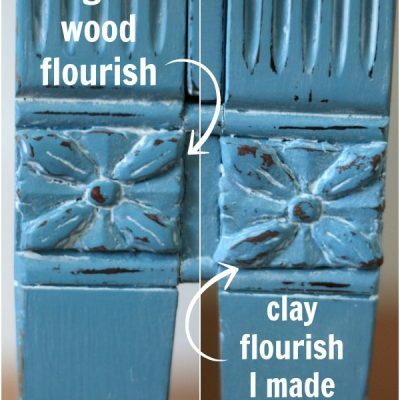 That’s the beauty of the Chalk Paint. The color you see is what resulted from about 2 coats directly over the old finish. You are so welcome…let me know how it turns out if you do the handle. You can add wire for stability and I know there are other clay products that will work too. What a gorgeous piece! Love it! Thank you for taking the time to reply to me about my query of the ASCP colour. I have a feeling it is a combination of the light in the photographs and perhaps the US paint supply being slightly different. Perhaps can see why I was confused from the screen shots below! Anyway, I’m pleased to find your work and I’m enjoying following your projects.